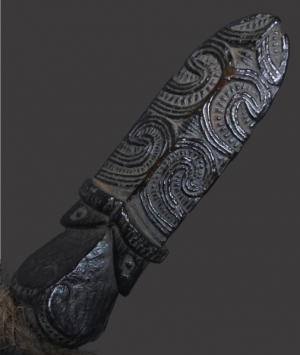 A formidable weapon in the hands of the Maori warriors of New Zealand, (‘Aotearoa’), the ‘Taiaha’, was used in close quarter, hand to hand combat. 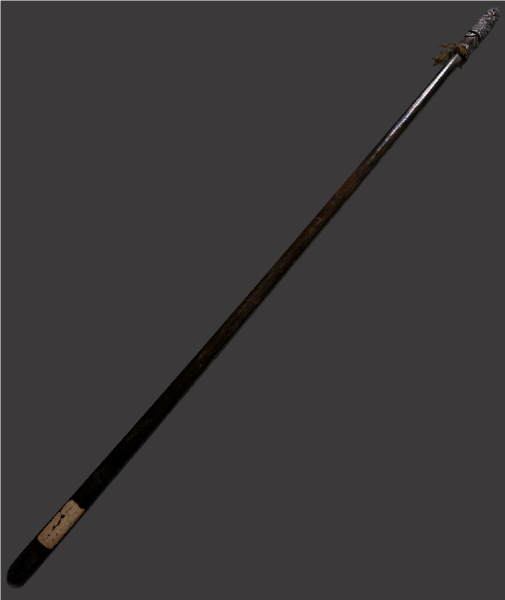 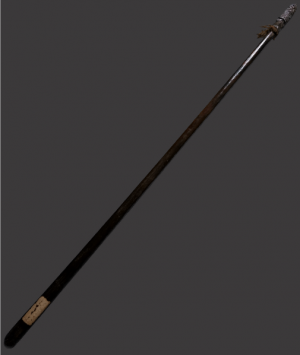 This wooden fighting staff was one of their most well known instruments of war, often mistakenly described as a spear due to its appearance, it was not designed for throwing, but being held in both hands, the pointed tongue end, (‘arero’) was used to attack an opponent with a thrusting motion, the flat blade like end for striking. 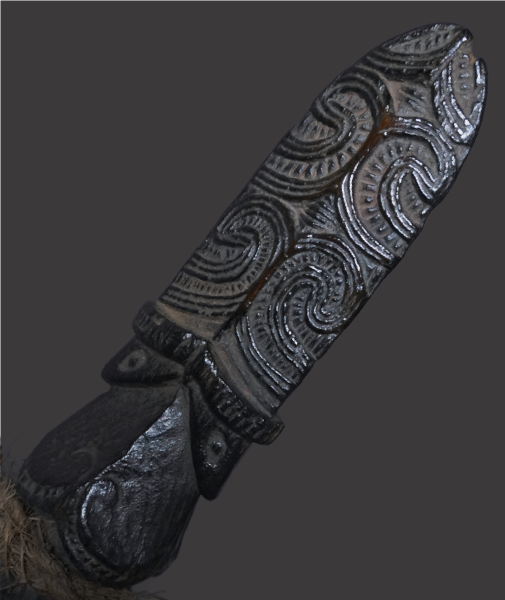 Maori warriors, (‘toa’), were well versed in its use, training for years to master the art of fighting with weapons, (‘Mau rakau’). 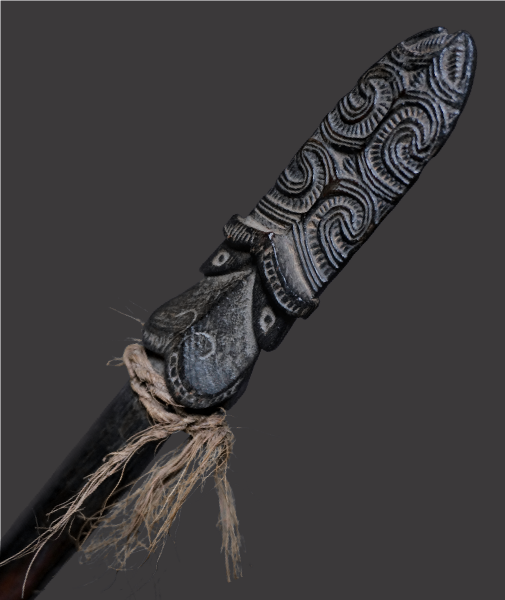 The ‘Taiaha’, was not simply a weapon, it was also an important social marker of rank and authority, as with other prestige items they were often passed down through the generations from father to son, their ‘mana’, increasing with age and victorious combative encounters. 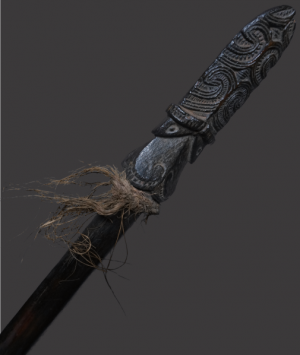 As such the warrior took his ancestors in to battle with him, the all seeing janus head of the ‘Taiaha’, facing both the struggle ahead and looking to battles past for strength and guidance, its decorated protruding tongue symbolically extended in aggressive challenge as ritually practiced by Maori warriors, prior to violent confrontation. This wonderful example is beautifully worn and marked from much handling and obvious long period of use, it displays a fine dark patina and retains some of its original fibre binding. 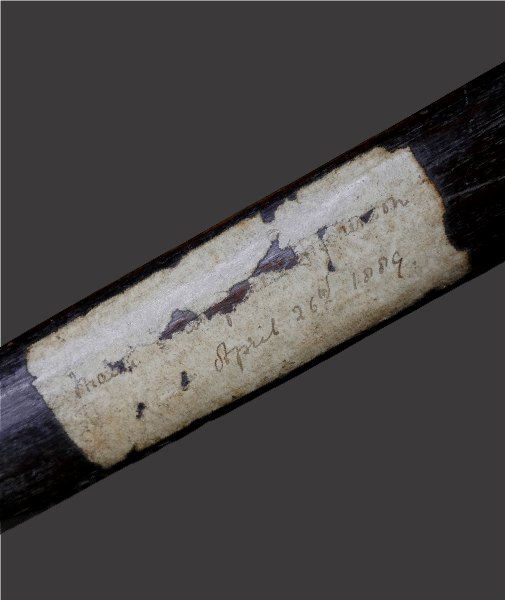 An old collection label affixed to the shaft, marked in handwritten ink, ‘Maori……. (the next few words now somewhat illegible)……on April 26th 1889’.